What Happens at Noah's Bar Mitvah Stays at Noah's Bar Mitzvah...Last week Noah celebrated his Bar Mitzvah Vegas-style. A great event logo and a few creative finishing touches made Lakewood Country Club feel like the Vegas Strip. As I predicted, option #1 was the FAVORITE. Thirteen year olds really seem to like taking iconic logos and making them their own. For the favors, we screenprinted Noah's logo on hooded sweatshirts. 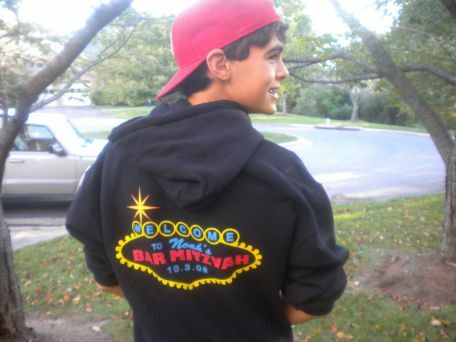 Hooded sweatshirts are one of our most popular Mitzvah favors -thirteen year olds can never have too many hooded sweatshirts. The sweatshirts were packaged and presented at the end of the evening in "gift bags" that were "personalized" with 4" round stickers that featured the event logo as well as each individual guest's name. Personalized gift bags are a popular way to present "sized" favors such as sweatshirts, sweatpants, etc. In addition to the sweatshirts and gift bag stickers, we put Noah's Vegas logo on cocktail napkins. We actually imprinted two sets of cocktail napkins-one set with the logo and the second set with the phrase "What happens at Noah's Bar Mitzvah, Stays at Noah's Bar Mitzvah" - very cute. If you have been reading FAVORITE THINGS for a while you may know that I believe custom cocktail napkins are an essential finishing touch for any event. My biggest pet peeve is going to a Mitzvah or a Wedding and being served a drink with a Marriott, Hyatt or Maggianos cocktail napkin. Nothing against these venues, but your event should not be their billboard. With a theme like Las Vegas the possibilities are endless but always remember that the most important part of your event is a happy Bar Mitzvah boy!